No brunch spread is complete without this recipe for easy Cheesy Baked Egg Cups. These individual servings are perfect for buffets, showers or even relaxed weekend mornings at home. Every mom deserves to be spoiled on Mother’s Day, and proper spoiling should always start with breakfast. These delicious (but crazy simple) Cheesy Baked Egg Cups will ensure Mom’s day starts off in tasty style. Indulging in a proper breakfast is one of the best ways we can think of to honor mom (or yourself), and this recipe for Cheesy Baked Egg Cups tastes far more decadent than the effort needed to pull it together. 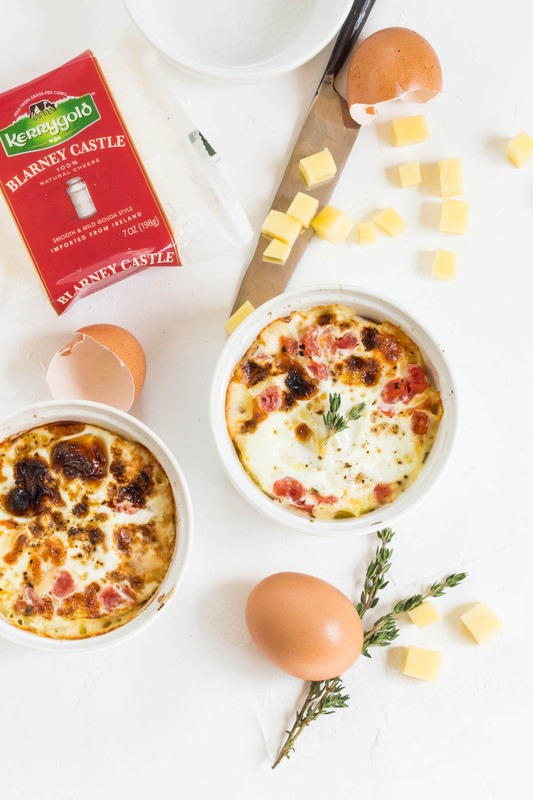 A handful of ingredients – mild, creamy Blarney Castle Cheese, fresh eggs, seasoned tomatoes and just a hint of cream – are baked together in ramekins to create individual servings that can be easily scaled to make one or twenty. Hosting a group for brunch? These Cheesy Baked Egg Cups can be prepped up to an hour ahead of time. Simply pop them in the fridge until you’re ready to bake them. Tip: These Cheesy Baked Egg Cups are easily customized to your taste. Craving a different flavor combination? Try diced ham and Aged Cheddar! A quick spin under the broiler gives these Cheesy Baked Egg Cups gorgeous browned tops and ensures they are perfectly cooked. Love your eggs a bit runny? Shorten the broiling time. Prefer your eggs fully cooked? Broil them a little bit longer. If you’re a runny egg fan like we are, save a few extra pieces of toast to mop up every last bit of cheesy egg goodness from the bottom of the ramekins. 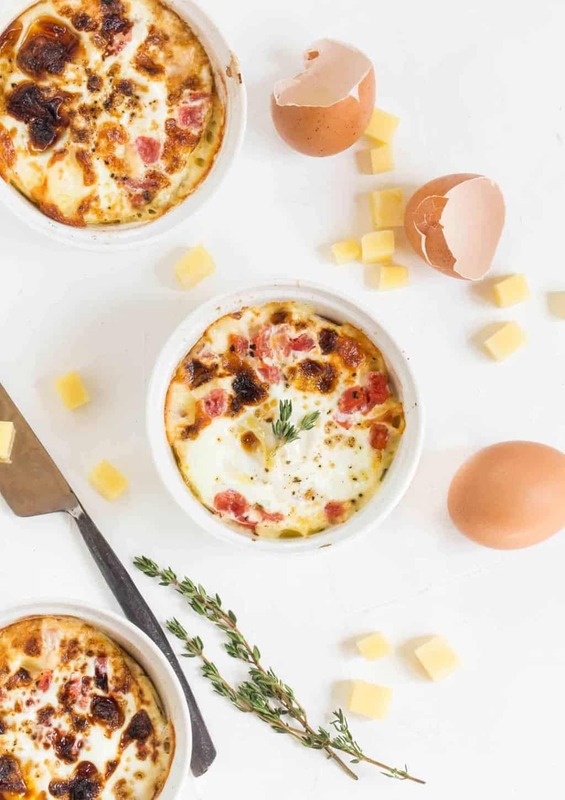 However you like your eggs, no one can argue about starting the day with these deliciously simple Cheesy Baked Egg Cups! Preheat oven to 375 degrees F. Spray 6 ramekins with cooking spray. Set ramekins on a baking sheet. Fill one ramekin with ½ ounce cheese and 1 tablespoon tomatoes. Crack one egg into ramekin and sprinkle with salt and pepper. Repeat process, adding another ½ ounce cheese, 1 tablespoon tomatoes, cracked egg and salt and pepper to ramekin. Drizzle ½ teaspoon cream over top of eggs. Repeat process with remaining ingredients and ramekins. Bake egg cups for 15 minutes and then broil for an additional 3-5 minutes or until tops are lightly browned. Cool 5 minutes and serve. Disclosure: This post was sponsored by Kerrygold. We only share products with you that we love and use all the time. Thanks for supporting the companies that make Garnish with Lemon possible.